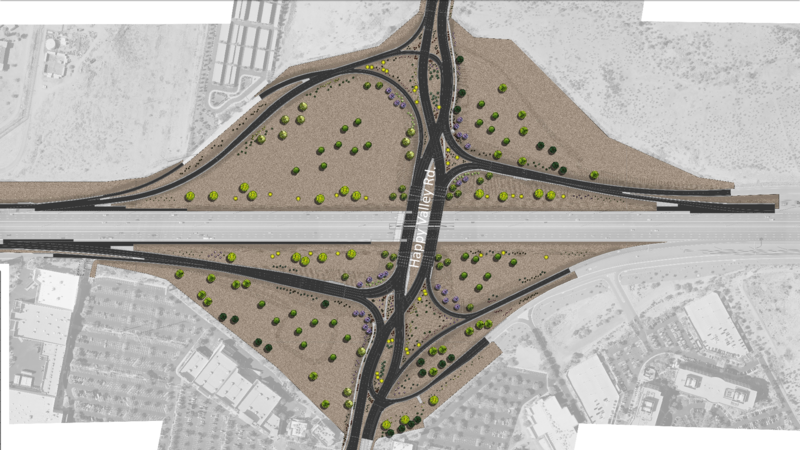 One disadvantage of DDI is lack of "through" off-ramp movement, it looks like this Arizona proposal makes them go right and then left to get to the frontage roads. However I'm not quite sure what's going on with the upper left on-ramp. Is that a weave? A braid? A signal? Based on zooming in to see the ramp striping, it looks like they don’t want people who’ve come from the bottom of the image who are heading to whatever that area at the top left is cutting across the traffic that’s coming from the top of the image and bearing right onto the highway, so they’re providing a separate movement. Wouldn’t be surprised if there were pylons or something to discourage the cut-across maneuver. No idea why it’s not the same as at the bottom right part of the image. 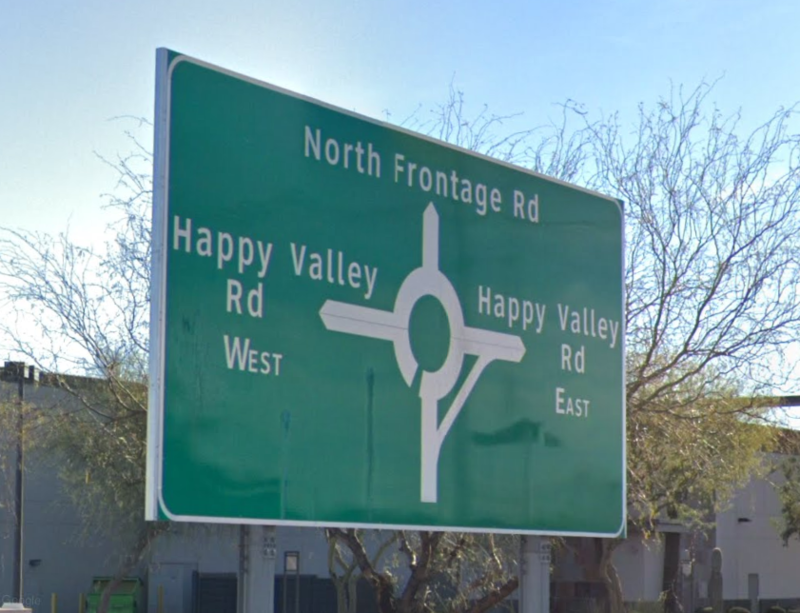 ^^^ It's not the same as the bottom right because the bottom right is a bona-fide frontage road that doesn't have immediate access back to I-17. The upper left, as SPUI noted, is a bus stop with a direct connection to southbound 17. They likely did it that way so that they'd only need one access from eastbound Happy Valley instead of two. It takes up no more room than the existing interchange. I just assumed it was a frontage road, not a bus-specific road. I'm not familiar with "bus on-ramp within a normal on-ramp"...you learn something every day! J&N is in a constant fog, blinded by the trees, and stuck in a forest. I'm not familiar with "bus on-ramp within a normal on-ramp"...you learn something every day! Pretty common where you have park-and-ride lots served by commuter buses that use the expressway - I used to see them in the Atlanta area. How so? The interchange area really isn't all that large. Heck - they're removing roundabouts...thought you would be excited about that. It does take up quite a bit of land when compared to the interchanges north and south of it. From my point of view, I'd rather narrow the interchange and continue the service drives (note them north and south) through the interchange. I tried to find another service interchange in the Phoenix area with a larger footprint than that proposed DDI, and i was unable to find one. Hell, it's larger than many freeway-to-freeway interchanges in the city. Let's just agree that it's not a small footprint when it's one of the largest service interchanges in a metro area of 4.7 million people. Hell, it's larger than many freeway-to-freeway interchanges in the city. Thats what I was thinking as well. It makes me wonder if that was the original or future plan for the area. I wonder if some of those darker lines hint at future uses for the land. The biggest loss here will be the gorgeous British-spec roundabout signage. 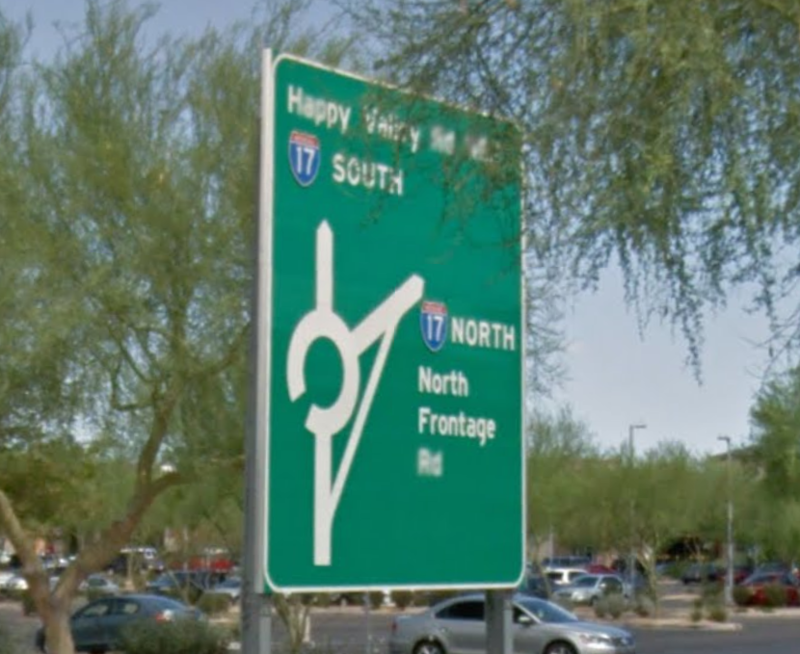 It's not the only roundabout interchange in Arizona with this style of signage, but it'll be one less, which is sad. 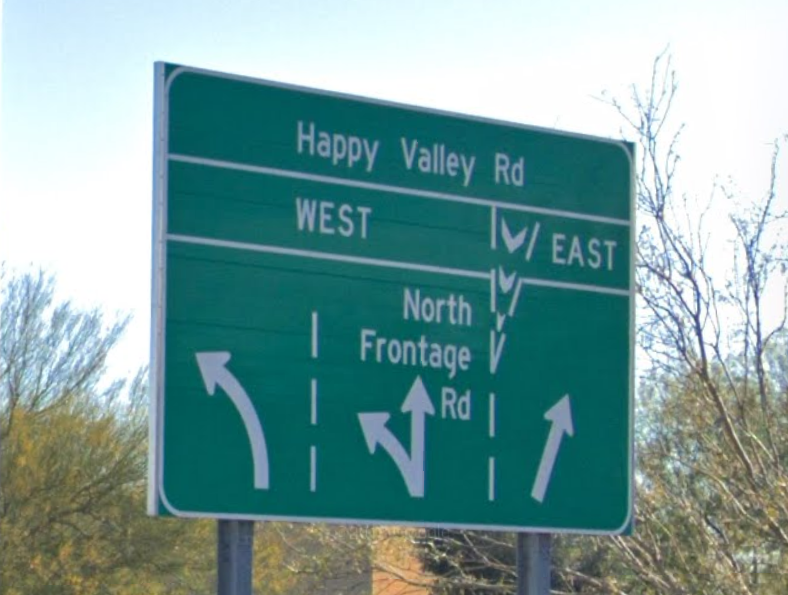 I don't think the chisel-point/stub arm map-type signs (1st and 3rd image) are too unusual in AZ, even today (certainly not as rare as their attempts at Australian map-type signs), but the lane-assignment signs are certainly quite rare. 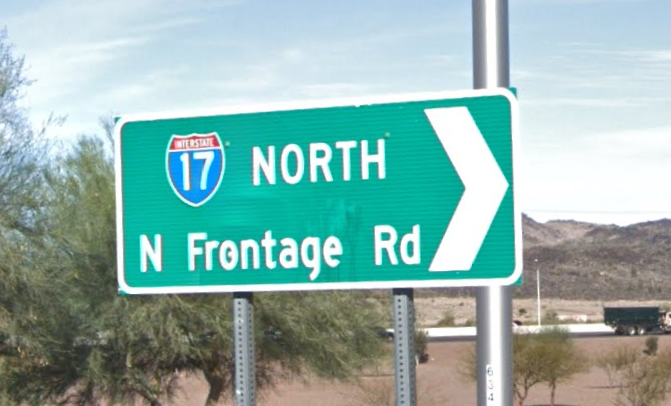 I've never seen such signs outsize Arizona, though I'm sure this is the result of Arizona's engineers pulling quite a few pages from Britain's signage manual over the years. Aside from this, I agree that the proposal is a silly use of land. Lots of room for something far more creative. His post wasn't about roundabout signage in general, but rather British-spec (more or less) roundabout signage specifically. And how does the link I shared differ much from the example he gave? Your signs use normal arrows instead of the 90° chamfer arrows, a hallmark of British road signs. Also, the diagram does not show a line continuing past the last exit to indicate 'u-turn'. Lines are pretty thin too. Yes, the arrows are vastly different. For this specific sign, U-turn not available to go the wrong way up a highway ramp. To me the functional aspects are far more important than the arrow style and line width. True, but standard Britisn design would still include an arrow to indicate the ability to continue past the last exit. Nevertheless, "functionality" is not something that is relevant to my post. I'm referring completely to the design, which has British roots. Though, to be honest, I do prefer the British designs, as several of the signage components are larger and a bit simpler.